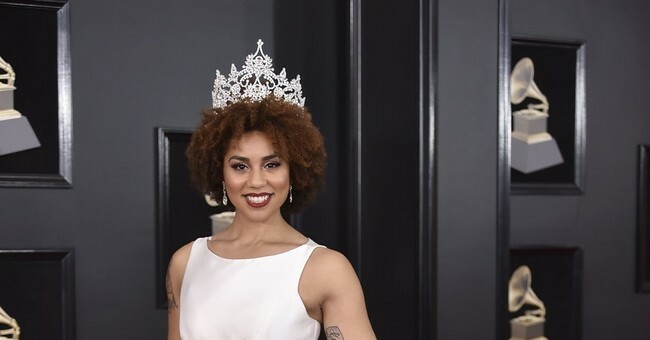 Viewers of the annual Grammy awards have now come to expect Joy Villa to make a conservative statement on the red carpet—from her flowing MAGA gown in 2017 to a pro-life dress last year—and she didn’t disappoint this year. This time, however, Villa wasn’t alone. The 27-year-old dressed as a barbed wire border wall coming into the Grammys, then, once inside, she revealed her gown underneath: a ‘Build the Wall’ dress designed by Desi Designs Couture. “Well to no surprise, I’m still a Trump supporter and supporting the president and what he’s doing," she told Fox News. "This is my Make America Great Again purse and dress is by Desi Designs Couture, and it represents the wall." She continued: "One in three women who are trying to come to this country illegally are sexually assaulted. Thousands of children are sexually exploited by coyotes bringing them across the border. Seventy percent of the heroin in our nation is brought in through Mexico. This is not personal against this country or the people. It’s not about race. It’s about protecting the people who are in this country. I’m Latina, I’m black. I support what the president says about building the wall, so that's what this dress represents." Villa also told Fox News that she ignores the haters. "Our first amendment right is free speech, so we should all be able to weigh in and think about what the president does. It shouldn’t just be one sided, ‘oh #resist!’ what about #MAGA?What about all the other people? Brown, black, Latina, Mexican, Indonesian. There’s tons of Trump supporters out there all of different colors. I know, I am one [and] I hang out with them." This year, Villa's pro-Trump spirit was joined by Ricky Rebel, who showed up wearing a Make America Great Again jacket.